− Fast, dual cure diazo photopolymer screen process emulsion with separate diazo sensitiser powder in sachets, for solvent based and co-solvent ink systems (inks containing a combination of solvents and water) including water based graphic arts inks and aqueous UV inks. − Must be processed and stored at temperatures not over 20°C. − 40% solids content before sensitizing (approx. 36% after sensitizing). − Can be coated wet on wet without intermediate drying cycle to reach a flat stencil profile with an Rz-value of approximatively 7 - 8 at 10 - 12 microns. − Stencils made with FOTECOAT 1010 can be printed with all ink systems containing both solvent/water or only solvents. − To reach a flatter stencil surface and to lower the Rz-value to improve edge sharpness of the print, 1 or 2 additional coats can be applied after the intermediary drying cycle. Stencil thickness will increase by 1 - 2 microns and the Rz-value decrease to 6 - 7 microns. 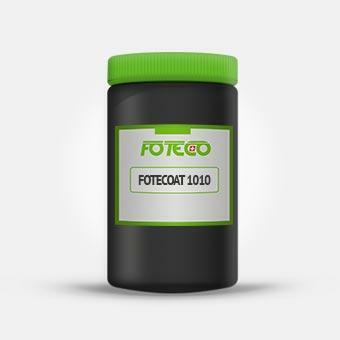 − FOTECOAT 1010 is ideal for machine coating. If necessary the emulsion can be diluted with water. Definition and resolution are excellent. Perfect mesh bridging is possible. After wash-out the stencil is very hard and has low swell characteristics. Printing with most ink types is possible. For long runs with aqueous textile inks and pure water media, FOTECOAT 1915 WR, FOTECOAT 1065 or 1636 are recommended. **Age, transportation and storing conditions influence the quality of the emulsion drastically. – The freshness of the diazo controls the pot life. 5KW metal halide lamp at 100cm distance; photopolymer bulb at 100 hours operating time. For fine details a post exposure is recommended. – All commercial decoaters can be used. A high pressure gun is recommended. – The longer the exposure, the better the through-curing of the stencil. If necessary make a post exposure. Both render the decoating easier.